Rocky mountain wood tick. 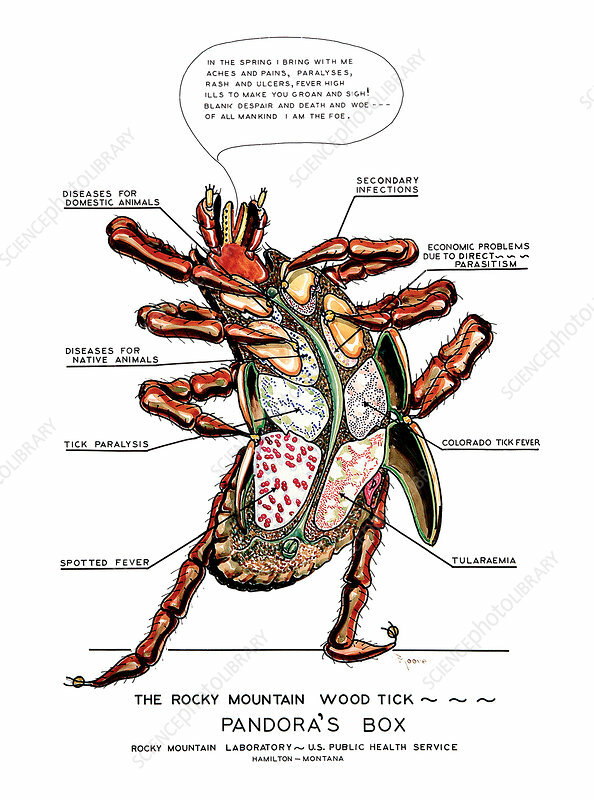 Illustration of the rocky mountain wood tick and the diseases it can cause by transmission of pathogens such as viruses, bacteria and protozoa. The labels mention the impact on domestic and native animals, secondary infections, direct parasitism, and diseases such as tick paralysis, Rocky Mountain spotted fever, Colorado tick fever, and tularaemia. The speech bubble contains a poem which includes some commons symptoms of tick-borne illnesses, such as aches, pains, rashes, ulcers and paralysis. Some tick-borne diseases can be fatal. Titled 'Pandora's Box', the illustration is by artist Thomas J. Moore (1892-1968). This artwork, produced for the US Public Health Service's Rocky Mountain Laboratory, Hamilton, Montana, USA.